As a recent member of the ANG Cyberpointers Chapter, I support our deploying armed forces with the Kissing Pillows community outreach project. The current request is to support a member’s brother’s Navy Helicopter Squadron (HSM-70) who are deploying in spring 2011. The Chapter’s goal for this effort is to support one unit’s deployment, preferably entirely by ourselves (not needing any additional help from other chapters). 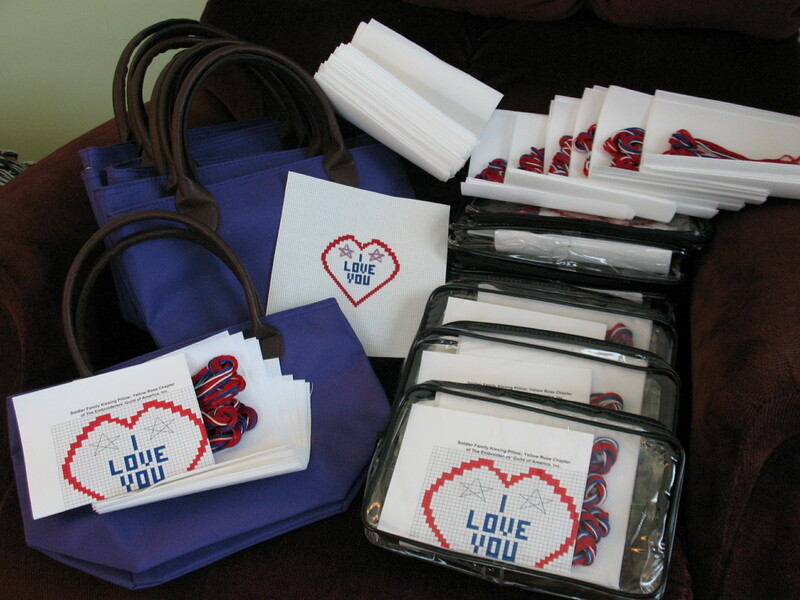 I’ve almost got 5 done for our own ANG Chapter’s, Mainline Stitchers, Kissing Pillows community outreach project. But since we haven’t set a deployment goal for a unit, I wanted to get these to Cyberpointers. They make such an easy project to carry with you or keep at work. Anyone else out there done some? The ANG MainLine Stitchers (PA) are beginning a new community service project, Soldier Family Kissing Pillows, for families of soldiers departing for service. Over Labor Day weekend, I made up enough kits to make 300 pillows (I ran out of threads for the last few but had them done in no time after purchasing more threads). And, at our Sept meeting, I handed out materials to 12 of us who agreed to make 85 pillows. I had 6 free pretty purple bags with handles for folks agreeing to make 10 pillows & 12 clear plastic zipper bags for agreeing to do 5. After that, it’ll be boring ziplok bags. And, whoever stitches the most will get a special thank you gift. This project is not about whether we are for or against war — it is about the loved ones left behind – especially the children. Stitching these pillows is a little something we can do to support our military and their families. The soldier kisses the pillow and gives one to each of his/her loved ones to hold onto until he/she returns from war. When this project began, it was for the children, but the mothers and wives requested them too. Then, the soldiers wanted one with everyone’s kisses on it to take with him/her off to war. Unfortunately, not all soldiers return and so, some pillow recipients have died. Can you imagine how important that little pillow is to the family – it’s the last thing daddy or mommy gave them and it has their kiss on it. One chapter learned about a young soldier who was killed in Iraq. When his body arrived in the United States among his personal effects was a kissing pillow. It is believed he had it in his helmet when he was killed. His family placed it on top of the American Flag that draped his casket. The family contacted the chapter to express their gratitude – he died with all their kisses and that has given them comfort. Our military and their families have always and always will sacrifice for those of us remaining at home. Stitching these pillows will show our gratitude for their service. 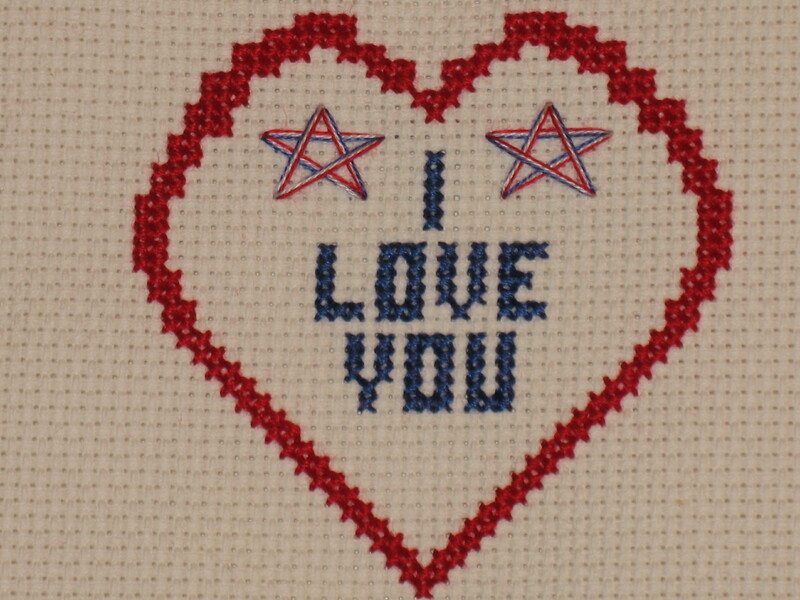 The “kissing pillows” are small (4” x 4”) cross-stitched pillows that say “I LOVE YOU” with two red, white, & blue stars within a larger red heart. They work up quickly (2-3 hours). 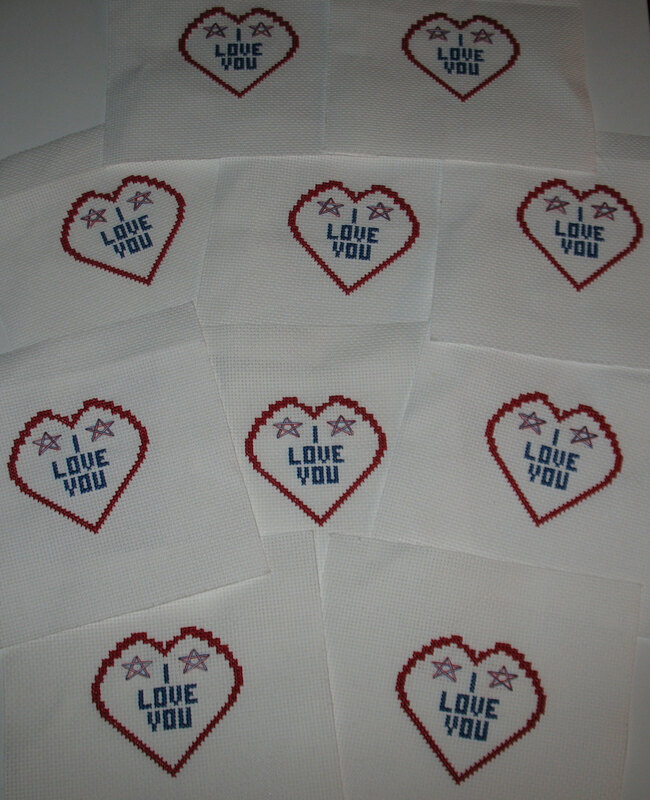 Once we have enough stitched, we’ll back them with fabrics in patriotic designs & stuff them. P.S. I got great prices on the Aida & floss at http://www.createforless.com and the materials arrived promptly & in good condition. I highly recommend the site.